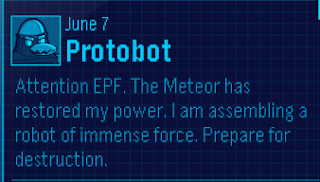 Recently Protobot sent all the EPF agents a message. Down below is a picture of it. 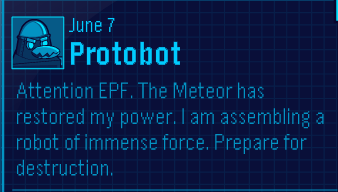 "Attention EPF. The Meteor has restored my power. I am assembling a robot of immense force. Prepare for destruction." I wonder is Protobot and Loki are working together? Anyway. So many questions. Where is Protobot assembling this robot? Where is his secret hideout? Where has he been all this time? Where did he get the parts for this robot? Anyway, enough with the questions. How do you think the meteor could restore his power? Leave a comment and let us know!